A running horse often is a challenge for a dog that wants to pursue the horse. The horse, however, does not accept such a pursuer and becomes irritated. If the dog does not give up, the horse tries to lose its pursuer by kicking back. Then the dog feels attacked and developes fighting spirit. That is what we see here. A very good representation of two animals opposed to each other: the horse defending itself and the dog reacting by attacking. In general the horse will at first threaten the dog and not really try to hit him. Here the situation has become worse and the horse will deliver a telling blow, unless the dog reacts very fast. A rider could have avoided this situation by controlling the horse and the dog would have had no more challenge. 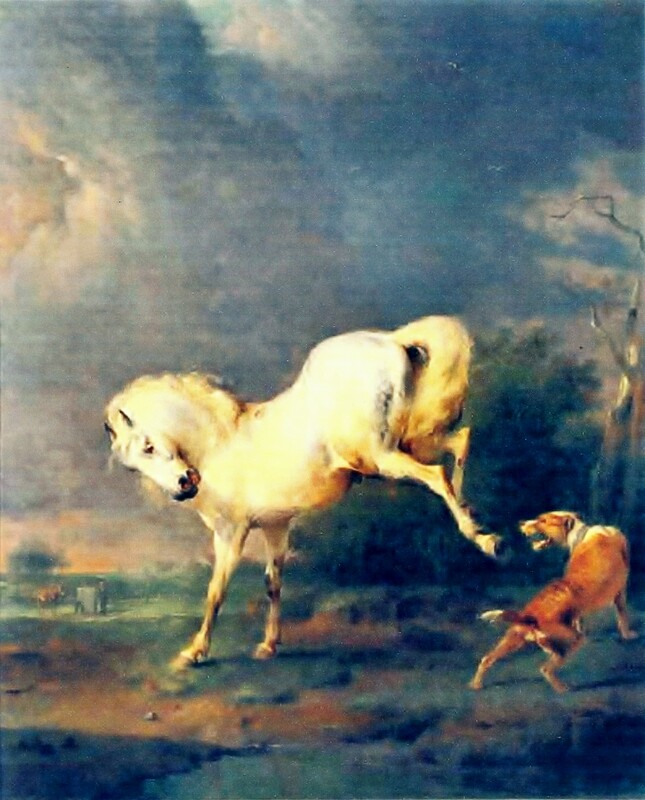 This scene of horse and dog is the opposite of the hunting scene with horse and dog, where they closely cooperate. That is a much more frequently chosen subject of artists while the above work is rare.